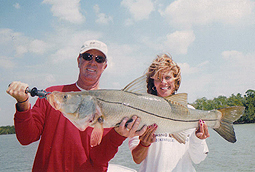 Saltwater Sports Fishing in the Backwaters of Naples, Marco Island, Goodland, The 10,000 Islands and the Everglades National Park with Fabian Fishing Charters. Capt. Danny Fabian has been fishing these waters for over 30 years. Since he moved to Naples at age 5 in 1973. He is licensed by the US Coast Guard and fully insured aboard his 22ft Pathfinder Tournament Edition bay boat rigged with a 200hp Yamaha, Motor Guide trolling motor, Power Pole XL, Lowrance Electronics and (very comfortable)high back Fish-On seats. 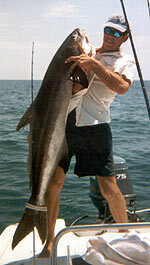 Backwater fishing in the 10,000 Islands and The Everglades National Park can be arguably the greatest fishing anywhere. It encompasses the largest mangrove forest in all the world. A literal maze of mangrove islands, rivers, creeks and bays. Many of these islands have private white sand beaches accessible only by boat. Around every corner is a oyster, sand or mud bar. This environment makes for the ideal breeding ground for hundreds of species of marine such as bottle nose dolphin, manatee, turtles, over 100 different species of birds and many more. Including the fish that brought you to my site snook, tarpon, redfish, spotted sea trout, grouper, snapper and well over a hundred species of fish that make my backyard their home. Having been a diver and spear fisherman for the past 20 years has given me the opportunity to observe fish of all SW FL species in the natural environment. Over the years and uncountable hours underwater I have gained a far better understanding of their movements and feeding habits that I could ever have above the water. This gives me a surprisingly unique perspective among the local guiding community. In SW FL we have 4 tides daily. 2 highs and 2 lows, depending on time of year, moon phase and wind direction. Variation in tide levels can be from 6 inches to 6 feet, an average day being 3 to 4 foot. Some people have favorite tides. This usually means their most frequented spots pay off best on that certain tide. Being that I am a busy guide I fish all phases of the tide and find some of my best fishing often comes on what someone else might consider a poor tide. One week my best fishing might come at the top of the incoming, on the next week it might be the bottom of the falling and or every other phase of the tide.